The ongoing assault on the supernatural order that generates our love of God is reaching a critical stage. The revival of Gnosticism, the stubbornness of socialistic-communistic thinking, and immoral, destructive behavior are reaching their apex of driving God from our consciousness as an object of worship and a guide to correct our vice-ridden behavior. If we look upon these elements as an atheistic force, we can detect the Theory of Evolution as one of its foundation stones. It is integral to the first two elements and provides tenaciously accepted support for the third. Beginning in the fourteenth century, Western civilization, based of the teaching of Christ, has come under severe attack by an increasing force we call the Revolution. The battle between those who worship our Creator and the godless intensified in the eighteenth century when the writing of Voltaire and Rousseau helped bring about the French Revolution. Another plateau of evil was reached in the next century when the ideas of Charles Darwin and Karl Marx brought the warfare into the cultural and economic domain. Darwin’s principal work, The Origin of Species, appeared in 1859 and provided the intellectual mechanism for a growing group of naturalists who looked upon nature as the fundamental source of all that exists. Thus they denied God’s role in creation, original sin and the necessity of divine grace. The slow-witted Englishman, as he accused himself without excessive modesty, is erroneously credited with discovering evolution. His main contribution to the downfall of Western culture lay in his pretension that all life results from undirected natural causes: time, chance and natural selection. The last claims that organisms better adapted to the environment produce biological change over long periods of time, thus forming new species. He explained the history of life in terms of an unintelligent natural process. He arrived at this fanciful idea by 1838 and spent the next 20 years trying to prove it without much success by today’s scientific standards. The impiety and infidelity in the writing that brought on the French Revolution worsened in the nineteenth century. Influential, atheistic naturalists and biologists such as Thomas H. Huxley and Ernst Haeckel immediately recognized the implications of Darwin’s hypothesis by extending it to the origin of man. Karl Marx also studied Darwin’s works and admitted this was on of the foundations of Marxism when he transferred them to economic and social organization. Thus the Theory of Evolution was on its way, not because of its scientific value but because to those who only see the surface of things, it does away with God and moral responsibility. As Darwinism was reaching its centenary celebration, it had attained the height of its influence. Several of its promoters, heretofore only museum directors, had attained prestigious professorships at Ivy League colleges. Julian Huxley, every bit as active and revolutionary as his grandfather, had just won an academy award for a nature film and was becoming the founding Director-General of UNESCO, the educational and scientific arm of the United Nations. But his most outstanding achievement was to induce the American government to fund a project that placed evolutionary biology textbooks in half the high schools in the country. Several fundamentalist Protestant groups reacted by developing their own colleges, schools, publishing houses and broadcast outlets. Dr. Henry Morris, founder of the Institute of Creation Research, suggested a plan to teach evolution, which he observed also promotes a religious world view, and creation science side by side in high schools using only scientific arguments for their respective positions. When conservative Republicans, following the coattails of Ronald Reagan, won the governorships in Arkansas and Louisiana in 1980, they had statutes enacted requiring balanced treatment of both creation science and evolution science. Predictably, the American Civil Liberties Union (ACLU) entered the fray and convinced federal judges all the way up to the Supreme Court that the enactments were unconstitutional (Edwards v. Aguillard). Biochemist Michael J. Behe explains that the complexity of the microscopic worlds that exists within cells disproves Darwin’s theory. In 1993, in the small beach town of Pajaro Dunes, California, a small group of scientists and philosophers from major academic centers in Europe and the United States gathered to question the Darwinian Theory that had dominated science for 150 years. Individually, each had significant doubts about the widely held evolutionary ideas and brought new insights to the resulting discussions that expanded the horizons of all those who attended. Since that seminar, each of the participants has devoted much time and study to understand and explain that the phenomena of life is the result of intelligent design and simply could not occur by blind chance over a long period of time. A brief sketch of two of the participants will illustrate their process of discovery. 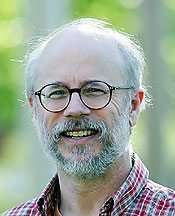 Michael Behe, who has a Ph.D. in biochemistry, admits that he went through all his school years believing that Darwinian evolution explained what we see in biology only because his instructors told him that it did and the academic atmosphere did not allow for any challenge. After he joined the faculty of Lehigh University, he came across a study that offered convincing arguments against Darwinian theory. Somewhat disturbed for being fooled for so many years, he ran laboratory tests that indicated that Darwin’s hypothesis could not adequately explain the complexity of nature. Behe had an enormous advantage over the earlier naturalists because of the vast explosion of knowledge on the cell, life’s most fundamental unit, during the last half of the twentieth century. Powerful technologies revealed elaborate microscopic worlds inside the cell including a variety of molecular machines, carrying things from one end of the cell to the other, much like traffic on a busy city street, except the biological machines are irreducibly complex. One machine, the bacterial flagellum, functions and looks like an outboard motor and has 40 moving parts. If any part is missing, the machine effectiveness is not just reduced; it does not work at all. To assume that these irreducibly complex machines could develop by “numerous, successive, slight modifications” as Darwin demanded is not realistic. Furthermore, according to Darwin’s natural selection, an organism rejects variations that are useless in helping it survive and preserves those that do. But could Darwin’s small, favorable variations produce a bacterial flagellum? Unless the flagellum is completely assembled and actually works, natural selection cannot preserve it, and it cannot be passed on to the next generation. Therefore, Behe concluded that natural selection could not explain the origin of the bacterial flagellum or any other irreducibly complex biological system. 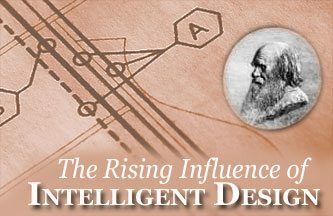 Instead, all his research pointed to Intelligent Design (I.D.). While some scientists saw the enormous difficulty of very complex structures like the eye, ear or heart developing over a long period of time, Dean Kenyon was concerned about the origin of life itself. For several years the leading chemical evolutionary theorist in the world, he tried to explain how life began on earth through a purely natural process and co-authored a best selling textbook on the subject. However, one problem perplexes him. There are 30,000 types of protein, each made of a different combination of 20 amino acids, to form structures inside the cell. But the proteins have to come together in precise sequence. Kenyon could not explain how the first proteins could be assembled without the help of genetic instructions. The instructions inside the cell come from a molecule known as DNA. He knew that the first living cell had to have DNA in order to replicate itself, but where did it come from? To Dean Kenyon, who spent a long lifetime trying to prove natural evolution, only one solution remained viable: I.D. The prospect of teaching I.D. in biology classes along the Theory of Evolution has been growing rapidly in recent months. Almost half the states are seeking equal time for I.D. or a critical analysis of the Theory; and in a Harris poll conducted in June 2005, 55 percent of the respondents also sought equal time for I.D. or creationism. Even President Bush has commented favorably on the idea in public. That prospect has evoked a strong protest from the evolutionary crowd and with good reason for their theory cannot stand scrutiny either in biology or anthropology (man descends from ape nonsense). The school board of Dover, Pennsylvania mandated that a notice be read to the biology students that there are gaps in the evolutionary theory and Intelligent Design is an alternative. That little gesture brought the ACLU to its feet and they are leading a challenge along with a few parents to the short notice in Federal District Court. If there are significant results, and we think there will be, we will report on them in a subsequent article. This entry was posted in Fighting the Culture War and tagged civilization, communist, conscious, creation, Creationism, Creator, Darwin, evolution, Gnosticism, God, history, immoral, intelligent, Intelligent Design, Marx, moral, origin, original, revolution, Rising Influence of Intelligent Design, Rousseau, scientific, sin, socialist, species, Voltaire by Jeremias Wells. Bookmark the permalink.